Our feet are our foundation and the Pilates Method can help us keep our feet strong and flexible. We tend to “forget” about our feet until they start to ache. Just like the rest of our body we need to “exercise” our feet regularly. We have 26 bones, 33 joints and more than 100 ligaments, tendons and muscles in our feet so lets give our feet a workout. Go barefoot sometimes and feel the earth beneath your feet, wiggle and spread your toes to get the blood flowing trust me it’s a glorious feeling. Did you know a lot of foot injuries are a result of a weak core? Having a weak core can cause you to compensate by changing your gait. As I have mentioned in a previous post the footwork series on the reformer as well as on the other pieces of Pilates equipment used in class, helps to mobilize and strengthen our feet and always in Pilates we are working our core. If you are not able to take a Pilates class here are a few exercises for your feet that can be done anywhere and anytime. 1. While standing, lift your toes and spread them apart. 2. Curl and uncurl your toes. 3. Use your toes to pick up marbles. 4. Lift and lower your big toe only. 5. Lift and lower your baby toe only. 6. 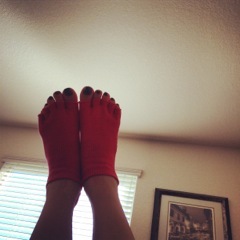 Glide your big toe away from the other toes and back again. 7. Repeat the above move but with the little toe only. 8. Stretch your toes with pedicure pads, this also helps to realign the bones of the feet. Lets keep our feet healthy and happy.